Manufactured in Great Britain and shipped across the World. 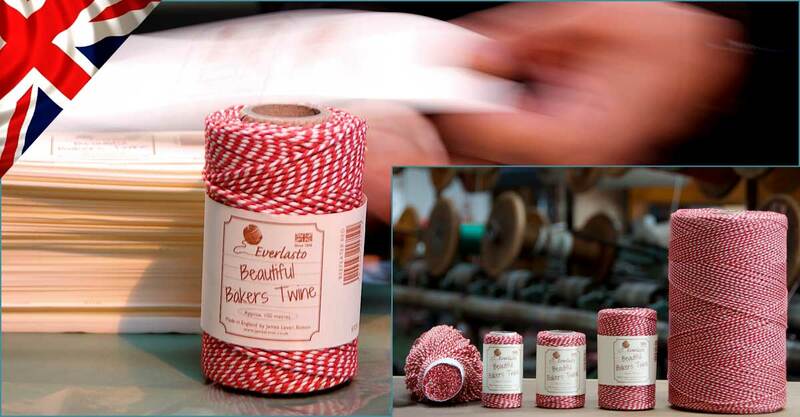 We are proud to state that our Beautiful Baker’s Twine is made in the UK from start to finish. From the sourcing of the yarn to the design and printing of the labels, the production of Beautiful Baker’s Twine supports a plethora of British businesses. To begin the process, the natural cotton yarn we use in our twines is sourced from a local spinners. It is then sent to a local yarn dying company, where it is dyed to our exact specifications to produce the colours used in the Beautiful Baker’s Twine range. Once dyed, it is then ready for our twine factory, where it undergoes several processes to form large bobbins of baker’s twine. It is the twisting process that gives the baker’s twine its distinctive candy stripe appearance. Now the baker’s twine has been produced, it then needs to be broken down into the required sizes for our customers. This is done on a spooling machine, where the baker’s twine is wound off the bobbins and onto UK manufactured cardboard tubes to form spools. None of the processes are automated. When the spools of baker’s twine have been completed, they are then transferred to our packaging department to be labelled, shrink wrapped and boxed. The labels are printed by a local printing company, the shrink wrap is sourced from a UK plastics company and the boxes from a local carton manufacturers. We can provide a bespoke manufacturing service - unique to your designs! Our Beautiful Baker's Twine truly is a 100% British product!